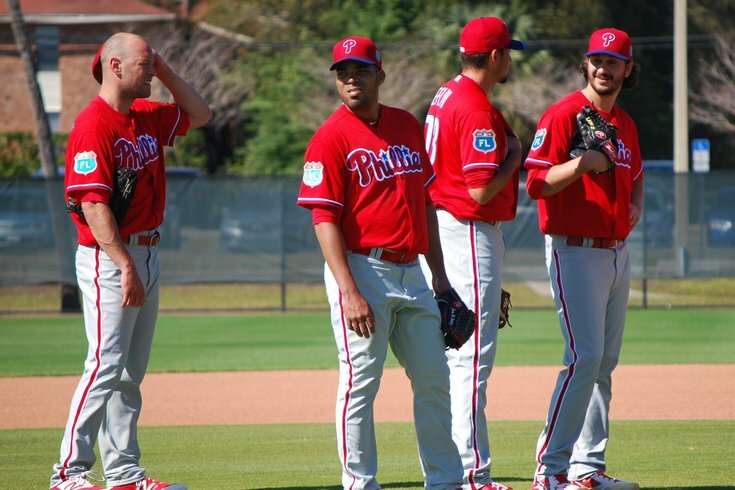 Phillies pitchers Frank Herrmann, Dalier Hinojosa, Zach Eflin, and Bobby LaFromboise during workouts in Clearwater, Fla.
CLEARWATER, Fla. – As a major league player without a firm grip on a roster spot with a team, the goal each offseason is probably to secure a place for the upcoming season before Christmas. A stress-free holiday beats one that takes uncertainty into the new year. Bobby LaFromboise was not afforded that luxury this offseason. Instead, he went through a winter that was defined by not only not knowing who he’d be competing with in the spring, but also what state he was headed to in less than two months. LaFromboise spent the majority of the last two seasons in the Pittsburgh Pirates organization, pitching in 17 major league games (1.54 ERA). He had pretty good numbers at Triple-A Indianapolis. But not enough to secure a spot on Pittsburgh’s 40-man roster. Here is what followed: two days before Christmas, the Los Angeles Angels claimed him off waivers from the Pirates. About a month later, on Jan. 26, the Angels designated him for assignment. Three days later, on Jan. 29, he was selected off waivers again, this time by the Phillies from the Angels. But then 12 days later, on Feb. 10, he was designated for assignment by the Phillies to make room for infielder Taylor Featherston. Then two days later, on Feb. 12, four days before pitchers and catchers were required to report to camp in Clearwater, Fla., LaFromboise cleared waivers and was outrighted to Triple-A Lehigh Valley … finally securing a spot on a spring training roster. LaFromboise is one of six lefthanders in camp competing for a spot in the Phillies bullpen this spring, along with Elvis Araujo, James Russell, Rule 5 pick Daniel Stumpf, and starters Adam Morgan and Brett Oberholtzer. Morgan and Oberholtzer, starters last season, could end up in the ‘pen as long men if they do not make the rotation. (Mario Hollands is also in camp, but still recovering from Tommy John surgery). And, by the way, LaFromboise was able to get out of his lease in Phoenix: thankfully, a lot of players find themselves in similar situations each winter, looking for a place to stay for spring training on short notice.